NAMM, the International Music Products Association, today announced that some 65,490 industry professionals, a slight increase from last years record-breaking attendance, came to Anaheim to see the latest music products and learn new ways to improve their businesses at the 2002 NAMM Winter Show. The NAMM Show, the music products industrys largest gathering, wrapped up today after four thrilling days of conference sessions, celebrity sightings, performances and exhibits, showcasing the hottest products the music products industry has to offer in 2002. The focus and theme of this years show, Uniting Our World Through Music, rang true to show attendees and exhibitors as the industry gathered to hear, play and experience music of every style. Heavy traffic at the NAMM Member Success Center demonstrated the industrys interest and commitment in creating new customers from the earliest ages to older adults and seniors. The music industrys next gathering will be at the NAMM Summer Session in Nashville, July 19-21. 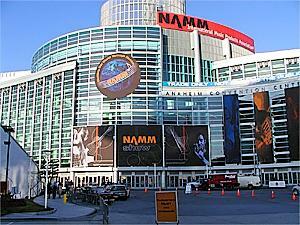 The next NAMM Winter Show will be held in January 2003 at the Anaheim Convention Center.